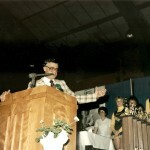 Bill Wilson speaks during 1990 hall of fame banquet at the War Memorial. 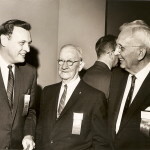 Bill Wilson, inductee Andrew Kerr, and Tom Nokes at the inaugural 1965 Cambria County Sports Hall of Fame banquet. 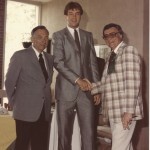 Inductee Pat Cummings shakes Bill Wilson’s hand during 1984 hall of fame event. 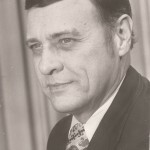 Joined Johnstown’s WJAC-TV in 1956 and ascended to the post of sports director in 1963, a position he held through 1989. Known locally, regionally and even nationally for his interviews with sports stars in both the amateur and pro game. Among some of the stars he featured were Roberto Clemente, Jack Ham, Muhammed Ali, Willie Mays, Joe Louis, Billy Conn, Rocky Marciano. 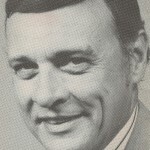 His sports segment, highlighted by a deep and rich voice and pull-no-punches approach, was one of the most memorable portions of WJAC-TV’s nightly broadcast. A regular in Bradenton, Fla., for Pirates spring training. Covered the Pirates, Steelers and Penn State football among his major beats. Reported on four Pittsburgh Steelers Super Bowl winners, two Pittsburgh Pirates World Series champions, three NCAA football championship squads (Pitt once and Penn State twice). Covered local Cy Young Award winner Pete Vuckovich, internationally legendary golfer Arnold Palmer and Steelers Hall of Fame linebacker Jack Ham of Johnstown. Co-hosted Penn State coach Joe Paterno’s syndicated weekly talk show for many years and also hosted a one-hour special on the Nittany Lions for ESPN. Worked the sidelines for Penn State’s Fiesta Bowl victory over Miami for the 1986 National Championship. Served as emcee of the Cambria County Sports Hall of Fame banquet from the 1960s into the early 2000s.